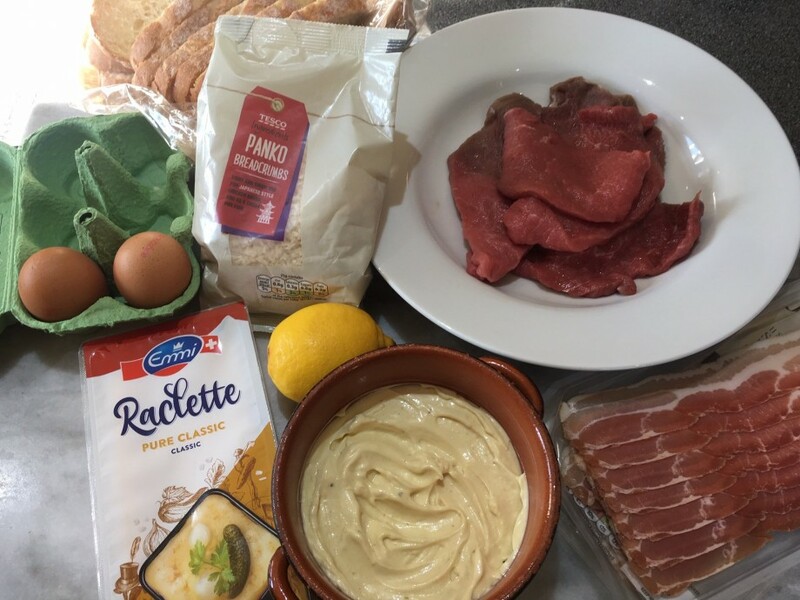 I had intended to cook veal cordon bleu –the classic dish involving cheese and ham sandwiched, or rolled, between veal escalopes. Then I saw a picture of a chicken katsu sandwich and inspiration struck. That, and the fact that I just couldn’t be bothered to mess around too much with the veal. 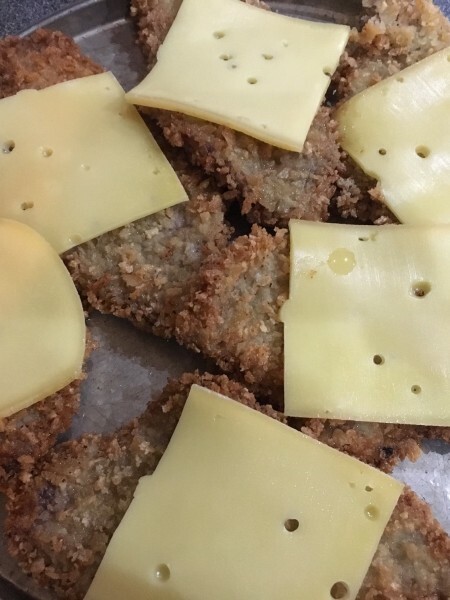 So, here is a sort of deconstructed veal cordon bleu- a veal schnitzel with melted cheese and crispy bacon on top rather than within. My cheese of choice is Raclette as it melts wonderfully. 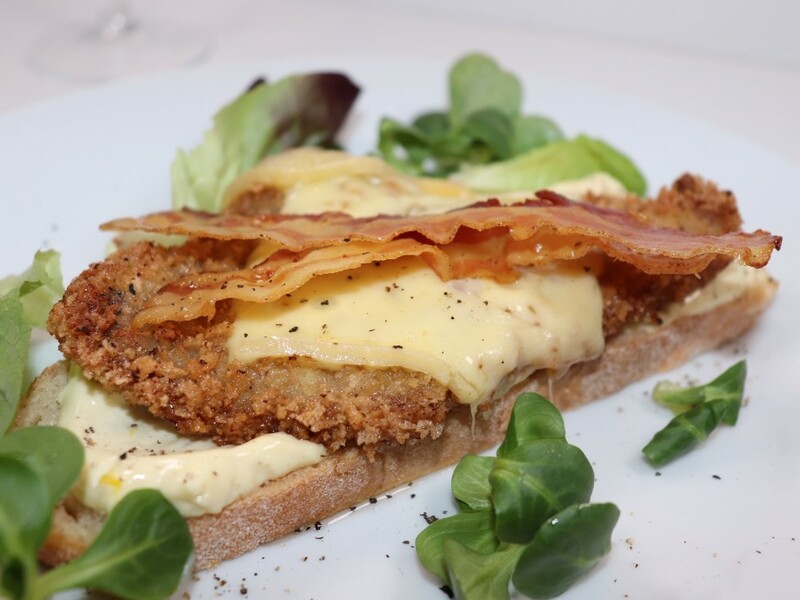 The crispy veal is placed on a slice of bread which has been generously slathered in a lemon mayonnaise. All that’s needed is a tomato salad and perhaps some lettuce leaves. If the escalopes are quite thick place them between two sheets of cling film and beat out with a rolling pin to a thickness of 4-5 mm. 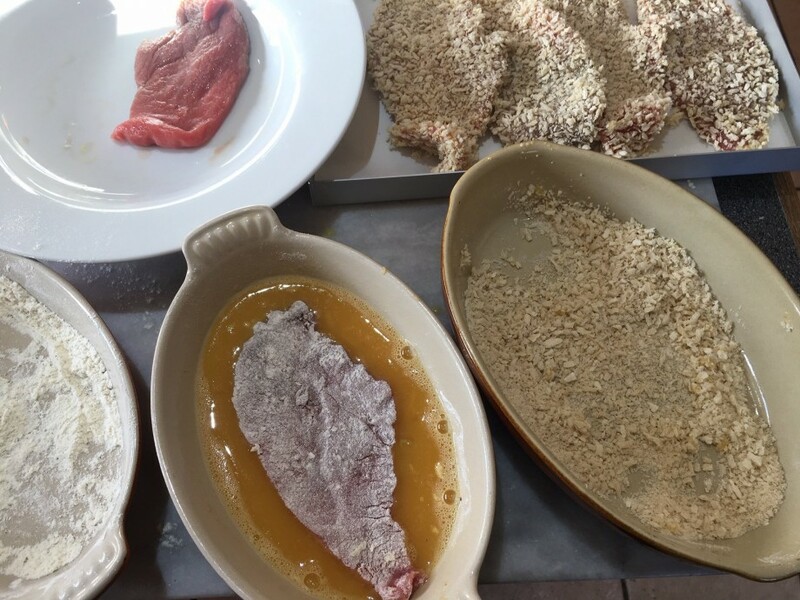 Put the flour, eggs and panko crumbs in three separate shallow dishes and dip each escalope into the flour, coating them thoroughly. 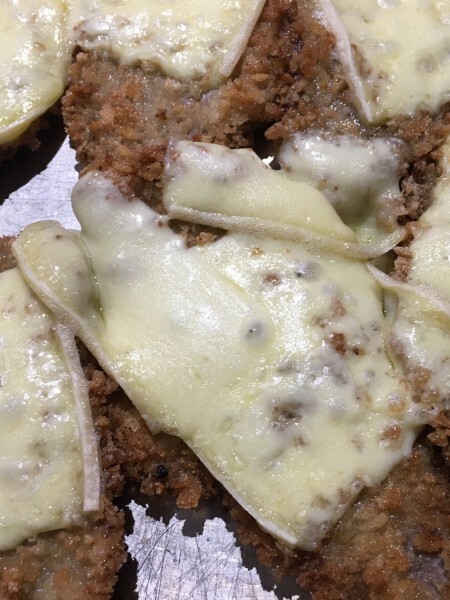 Immerse each escalope into the egg, and finally coat in the breadcrumbs. Place on a baking tray and refrigerate. You can prepare the veal escalopes a few hours in advance. Mix the grated lemon rind and juice with the mayonnaise and set aside. Heat the oven to 200˚c, fan oven 180˚c, mark 6. Line a baking sheet with non-stick parchment and lay the pancetta slices on top. Cook in the oven for 6-8 minutes or until crispy and golden. Set aside. Turn the oven down to 140˚c, fan oven 120˚c, mark 1. Pour the oil into a large frying pan to a depth of about 1 ½ cm. Place on a moderate heat and when the oil is hot enough to brown a cube of bread in 20 seconds, carefully place two or three escalopes into the hot oil. Fry for 1 minute until golden then turn over and continue to fry for a further 1 minute. Transfer to a baking tray and keep warm in the oven while you fry the remaining escalopes. Warm the pancetta in the oven. Heat the grill to high. Spread the mayonnaise on the sliced bread. Lay a slice of Raclette cheese on top of each escalope and melt under the grill for a minute or two, until the cheese is starting to bubble. Place the escalopes on each slice of bread and arrange a couple of rashers of pancetta on top. Serve immediately.